Each time I attend an AAHPM Annual Assembly, I’m amazed at the growing number of attendees. Amid those thousands of people, it’s easy to forget that we have a pretty serious workforce problem on our hands. But then I attend the Research Special Interest Group (or “SIG”) meeting, and I’m quickly brought down from my blissfully ignorant orbit to face another striking reality: clinical workforce issues also signal challenges for research and mentorship in our field. We don’t often talk about this, but shortages in the workforce limit our ability to do high-impact, innovative, important research. Even the largest, most research-oriented centers may have just one senior researcher on faculty, and some prominent institutions have none. In this restrictive environment, how can a student, or trainee, or junior faculty member even get started doing palliative care research? How can we meet the mentorship and “start-up” needs of developing researchers in our field? In our Research SIG discussions, much of our time is spent talking about how to find mentors or how to get involved in palliative care research. This is clearly an area of need in our field. So as this year’s Research SIG Chair, and as someone who spends much of my time thinking about (and trying to do!) research in palliative care, I thought it might be helpful to host this TweetChat on research-related issues in palliative care. Let’s talk about challenges, opportunities, how to get started, how to find a mentor, and even discuss ideas about important research priorities for the field. Join me @tomleblancMD this Wednesday night at 6pm PST to explore and discuss issues in #hpm research! 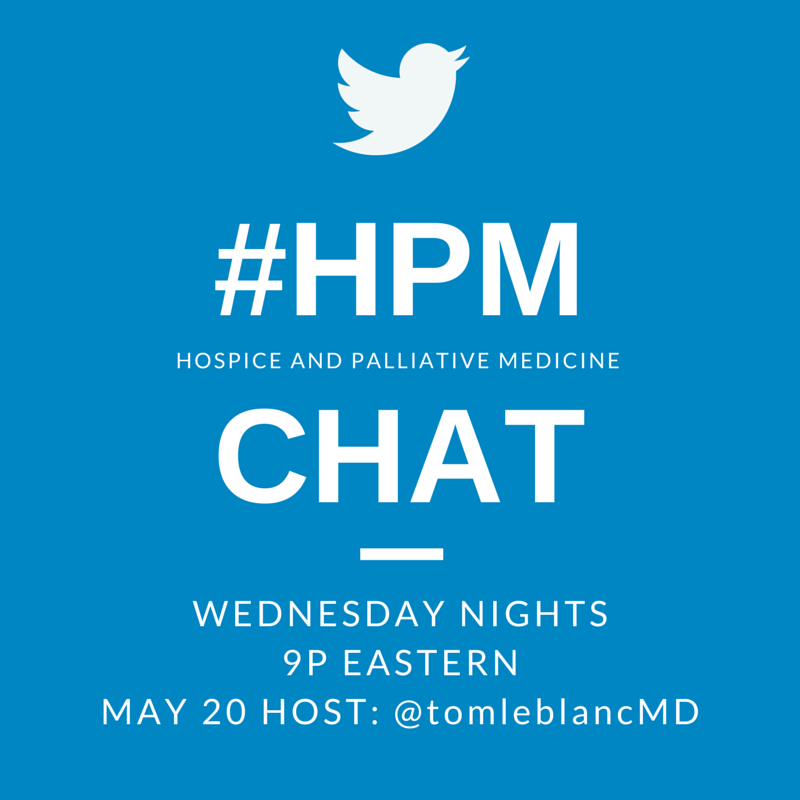 T1 – What advice would you give to someone who wants to get started in #hpm research? T2 – What are the most important priorities for research in #hpm? If you are new to Tweetchats, you do not need a Twitter account to follow along. Try using the search function on Twitter. If you do have a Twitter account, we recommend using tchat.io for ease of following.